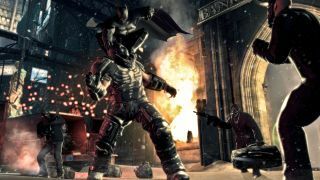 Surprise one: Batman: Arkham Origins will launch with a multiplayer mode . Surprise two: it's a weird confluence of Splinter Cell and Gears of War. I played about an hour of Origins' eight-player online component last week here in San Francisco with fellow press. The most interesting thing about it is its 3v3v2 format: two teams of gangs fight over control points while a pair of player-controlled heroes swoop around, disrupting their progress. The heroes—Batman and Robin—win by filling an “intimidation meter” that increases whenever they knock out a thug (with bonuses awarded for varying the type of takedown that's executed) and depletes whenever a hero dies. Team Joker and Team Bane—the gangs—win by exhausting the respawn ticket pool of their opponent or by holding control points for longer in the match. Splash Damage —known for its work on the Enemy Territory games and Brink —is behind this asymmetrical multiplayer mode, working in parallel with Origins' campaign team at Warner Brothers Games Montreal. The British studio's specialization in multiplayer makes it a great fit, and I admire that Splash hasn't simply shoe-horned Arkham into a conventional multiplayer template. But without the heroes lurking around, this would be a conventional, cover-based shooter: the gang members unlock weapons, outfit pieces, and abilities through play, and their movement and survivability is along the lines of Gears of War and other games in the genre. That puts the onus on the hero roles to make things interesting, and they do to some extent—being dive-kicked in the spine by a gliding Batman adds some paranoia to the mix. But in practice, Batman and Robin felt less intimidating to fight against than I would've liked. It's possible a pool of inexperienced players might not've given me the best sense of how much the heroes can stifle the bad guys' progress, but I was put off by how difficult it was to hide as a hero. Everyone can toggle Arkham's x-raying, Invisible Predator vision mode to reveal the location of every other player. Gang members can only use it for a brief period before the ability recharges, but flicking it on and off was usually enough to make a mental note about where heroes were. I do like that Joker and Bane's thugs aren't fish in a barrel—if anything, Batman and Robin felt too fragile—but the absence of a class system or any other distinguishing elements for gang members beyond weapon selection made me feel like I was playing a generic goon every time I respawned. Origins just doesn't feel designed from the ground up to support third-person shooting. The player who fired first in most of my shootouts usually won. Credit to Splash Damage's work on Brink's character creation system, though, Origins' avatar customization is terrific: I built a horrid, huge-bellied Joker-Santa Claus by attaching an acid-green beard to my thug. Splash Damage and WB only showed a single map, and was unwilling to talk about how many maps the mode would contain, or how they would differ from one another, but did say that they wouldn't be ripped directly from the campaign. The map we played, Blackgate Prison, felt cavernous in a way I liked for the hero team—there were always grapple points within reach—but as a Joker or Bane player that spaciousness felt more like vacancy. I'm glad to see Splash Damage and WB pursuing a creative, asymmetry-driven mode for Origins' multiplayer, but based on this short hands-on I'm not confident that it's something I'll spend much time with.